Teapots and Polka Dots: Hoo Hoo Ha Ha Ha! While waiting in the checkout line at my local Whole Foods grocery store, I spied this product and burst out laughing. I HAD to buy some--I mean, look at that ridiculous face! And the pom-topped hat! 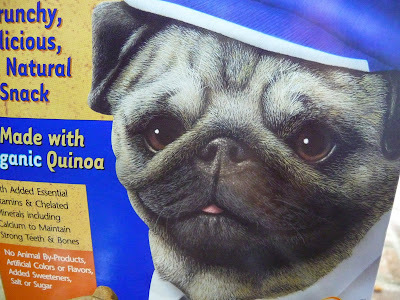 Highly PhotoShopped, but still...it's pug-tastic dog treats, people! What's not to love about that? 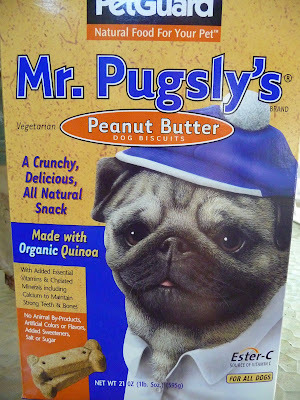 Total impulse buy, but I bought a box to take home to my two pug thugs. So, did they like the treats? Umm, does a pug poop in the woods?